Eleven weeks ago I gave birth to my second daughter, Hope. As we began to adjust to life as a family of four, it became clear to me that each of our girls is unique. Not only are they unique from each other, they are unique from their father & me as well. Harper, my eldest daughter, has luscious, curly and at times, tangly hair. I’m jealous. She has the hair I’ve always wanted. You see, my hair is straight. Because her hair is so different from mine, at first I found it hard to manage. But after 4 years of trial and error, I have found a groove and her hair care routine is no longer daunting, in fact, it’s fun. So you may be thinking, what does my daughter’s beauty routine have to do with Down syndrome? It’s as simple as this, diversity is beautiful. For me, celebrating the world with it’s vast array of colors, abilities, shapes, and sizes is what makes life fulfilling, whether it’s curly hair or an extra chromosome. I became an advocate for the Down syndrome community quite by accident. I was a music teacher at the time and one of my students introduced me to a family who had a son with Down syndrome. Having little experience working with children with Down syndrome, I was pleasantly surprised at the amount of love, joy, and vigor for life that exuded from his tiny body. While his diagnosis might have handed him a long list of limitations, he was determined to live his life to the fullest. Meanwhile, as I reflected upon my own life, I quickly realized how much I take for granted and often forget to be grateful for what I have. From that brief interaction with him I was inspired to appreciate my own gifts. This is when I began to see life through a new lens. I felt my heart being pulled in a new direction and little by little, I transitioned from my career as a music teacher into the field of social work. As I navigated this new path I had the opportunity to meet over 100 individuals with Down syndrome and their families. The more I experienced them, the more captivated I became. I began to notice a trend. The majority of individuals with Down syndrome that I had the pleasure to come into contact with were adults and I was seeing few young children being diagnosed. That’s when I came upon the troubling discovery that this scarcity was brought about by prenatal testing. Due to new developments in genetic testing it is easier to discover the gene that indicates a possibility of having a child with Down syndrome. As a result there is currently a 92% abortion rate among women who have received this diagnosis. From my experience, most of the women choosing this path have not had the opportunity to come face to face with a person that has Down syndrome or their families. In many cases, these newly pregnant, and vulnerable mothers are being bombarded with a list of all the reasons why they shouldn’t carry their baby with Down syndrome to term. They are rarely introduced to the joys and wonders of having a child with Down syndrome. I believe these women are fearful of the unknown. Aren’t we all? As a mother myself, I understand the fear of uncertainty. No matter how many books you read, classes you attend, or baby dolls you diaper, the journey of parenting is never without it’s bumps and bruises. Even as I prepared for my second daughter to arrive, I thought I had this parenting thing down! I mean, I had done this all before with my first daughter, surely by now I was a pro? The truth is, none of us are ever fully equipped for the twists, turns, and surprises that come with being a parent. I mean let’s be honest, projectile body fluids can come flying at you at any moment! But in my experience I have learned that it’s not always what happens to you, it’s how you handle it. This approach to life has guided me to propose a new perspective. A perspective that I believe will foster hope for mothers with the prenatal diagnosis of Down syndrome. I also hold hope that it will serve in broadening understanding in our overall community as well. 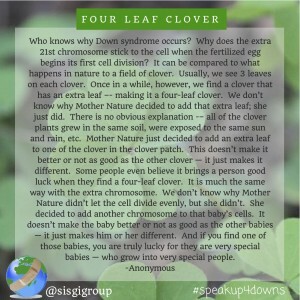 I came across a poem while volunteering for the Down Syndrome Association of Los Angeles many years ago that likens Down syndrome to finding a four leaf clover. You see, a four leaf clover is merely a genetic variation of a three leaf clover. For whatever reason it carries an extra leaf. People with Down syndrome carry an extra 21st chromosome. And yet, a four leaf clover isn’t looked upon as if it is disabled or less than. A four leaf clover is viewed as one of the luckiest things you can find. After seeing firsthand the good fortune that families of children with Down syndrome experience, I believe the woman who has the honor of carrying a child with Down syndrome are to be considered the luckiest mother on earth. 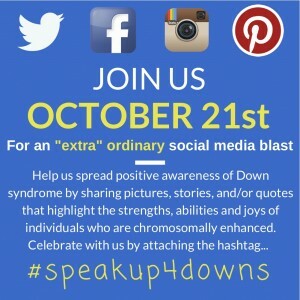 In celebration of Down syndrome awareness month we will be launching an “extra”ordinary social media blast on October 21st. Our goal is to bring attention to the strengths and abilities of people with Down syndrome. We invite people to participate by sharing pictures, stories, and/or quotes about the wonders, joys, and blessings of raising a child with Down syndrome. Follow The SISGI Group on Instagram, Twitter, and Facebook and join in on the chat using the hashtag #speakup4downs. We look forward to seeing how Down syndrome has made your life “extra”ordinary. Heather Mercer is beginning her second year as a Master in Social Work Student at the University of Southern California concentrating on Community Organization, Planning and Administration. For nearly 20 years Heather has dedicated her time to helping others, specifically those with developmental disabilities. As a case manager, behavioral therapist, direct care provider, volunteer, and advocate, Heather has poured her passion into bringing awareness to the beauty and value of life for all people. Upon her completion of her MSW, Heather’s focus is to create an agency that provides education and support for pregnant women, most especially those with a prenatal diagnosis of Down syndrome. Thank you for writing such a personal and heart warming tribute to your daughter and others who have Down Syndrome. Each of us has our own strengths and limitations, including those who others might feel are very “different”. Continue to celebrate their uniqueness and treat each one of them as the Four Leaf Clover they are. I am not yet a mother but hope to be one day. I have wondered this very thought if I am lucky enough to conceive and am unsure as to what I would do. Given our current technology, it is amazing the things we can find out but do see how this can cause controversy. Children with Down syndrome are caring and amazing beings. The metaphor of the four leaf clover gives a different perspective of this and believe more awareness about this is necessary. I was unaware at how many unborn children this has affected and will continue to affect as this is not something parents most likely consider. Thank you for sharing. Heather, I believe you are creating something that will serve the world in ways we have yet to comprehend. Proud to be your father.